Validation is a good way to assess the predictive accuracy of a supervised learning algorithm, and the rule of thumb of using 70% of the data for training and 30% of the data for validation generally works well. However, what if the data set is not very large, and the small amount of data for training results in high sampling error? A good way to overcome this problem is K-fold cross-validation. Divide the data set into K partitions. Designate the first partition as the validation set and designate the other partitions as the training set. Use training set to train the algorithm. Use the validation set to assess the predictive accuracy of the algorithm; the common measure of predictive accuracy is mean squared error. Calculate the average of the mean squared error from all K validations. Compare the average mean squared errors of all models and pick the one with the smallest average mean squared error as the best model. Test all models on a separate data set (called the test set) to assess their predictive accuracies on new, fresh data. If there are N data in the data set, and K = N, then this type of K-fold cross-validation has a special name: leave-one-out cross-validation (LOOCV). In The Elements of Statistical Learning (2009 Edition, Chapter 7, Page 241-243), Hastie, Tibshirani and Friedman recommend 5 or 10 for K.
The heat capacity of a system is the amount of heat required to increase the temperature of the system by 1 degree. Heat is measured in joules (J) in the SI system, and heat capacity is dependent on each substance. To make heat capacities comparable between substances, molar heat capacity or specific heat capacity are often used. Molar heat capacity is the amount of heat required to increase the temperature of 1 mole of a substance by 1 degree. Specific heat capacity is the amount of heat required to increase the temperature of 1 gram of a substance by 1 degree. For example, over the range 0 to 100 degrees Celsius (or 273.15 to 373.15 degrees Kelvin), 4.18 J of heat on average is required to increase the temperature of 1 gram of water by 1 degree Kelvin. Thus, the average specific heat capacity of water in that temperature range is 4.18 J/(g·K). A machine learning algorithm can be classified as either parametric or non-parametric. A parametric algorithm has a fixed number of parameters. A parametric algorithm is computationally faster, but makes stronger assumptions about the data; the algorithm may work well if the assumptions turn out to be correct, but it may perform badly if the assumptions are wrong. A common example of a parametric algorithm is linear regression. In contrast, a non-parametric algorithm uses a flexible number of parameters, and the number of parameters often grows as it learns from more data. A non-parametric algorithm is computationally slower, but makes fewer assumptions about the data. A common example of a non-parametric algorithm is K-nearest neighbour. To summarize, the trade-offs between parametric and non-parametric algorithms are in computational cost and accuracy. In my recent lesson on controlling for confounders in experimental design, the control group was described as one that received a neutral or standard treatment, and the standard treatment may simply be nothing. This is a negative control group. Not all experiments require a negative control group; some experiments instead have positive control group. A positive control group is a group of experimental units that receive a treatment that is known to cause an effect on the response. Such a causal relationship would have been previously established, and its inclusion in the experiment allows a new treatment to be compared to this existing treatment. Again, both the positive control group and the experimental group experience the same experimental procedures and conditions except for the treatment. The existing treatment with the known effect on the response is applied to the positive control group, and the new treatment with the unknown effect on the response is applied to the experimental group. If the new treatment has a causal relationship with the response, both the positive control group and the experimental group should have the same responses. (This assumes, of course, that the response can only be changed in 1 direction. If the response can increase or decrease in value (or, more generally, change in more than 1 way), then it is possible for the positive control group and the experimental group to have the different responses. In short, in an experiment with a positive control group, an existing treatment is known to “work”, and the new treatment is being tested to see if it can “work” just as well or even better. Experiments to test for the effectiveness of a new medical therapies or a disease detector often have positive controls; there are existing therapies or detectors that work well, and the new therapy or detector is being evaluated for its effectiveness. Experiments with positive controls are useful for ensuring that the experimental procedures and conditions proceed as planned. If the positive control does not show the expected response, then something is wrong with the experimental procedures or conditions, and any “good” result from the new treatment should be considered with skepticism. In addition to choosing the number of levels for a quantitative factor in designing an experiment, the experimenter must also choose the range of the levels of the factor. If the levels are too close together, then there may not be a noticeable difference in the corresponding responses. If the levels are too far apart, then an important trend in the causal relationship could be missed. the overall relationship between growth rate and temperature is rather complicated, and choosing temperatures that are too far apart might miss important trends. Once again, the experimenter’s prior knowledge and hypothesis can be very useful in making this decision. In this case, the experimenters had the benefit of their mathematical models in guiding their hypothesis and choosing the range of temperatures for collecting the data on the growth rates. Gänzle, Michael G., Michaela Ehmann, and Walter P. Hammes. “Modeling of growth of Lactobacillus sanfranciscensis and Candida milleri in response to process parameters of sourdough fermentation.” Applied and environmental microbiology 64.7 (1998): 2616-2623. In chemistry, a common type of work is the expansion or compression of a gas under constant pressure. Recall from physics that pressure is defined as force applied per unit of area. Consider a chemical reaction that releases a gas as its product inside a sealed cylinder with a movable piston. Image from Dpumroy via Wikimedia. 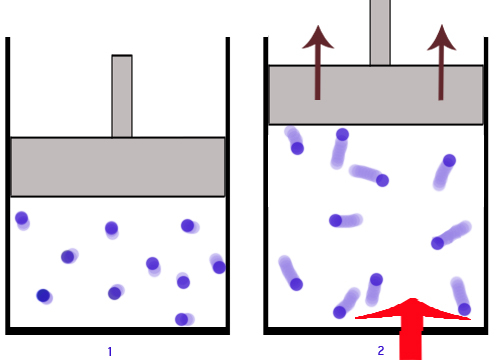 As the gas expands inside the cylinder, it pushes against the piston, and work is done by the system against the surroundings. The atmospheric pressure on the cylinder remains constant while the cylinder expands, and the volume of the cylinder increases as a result. The volume of the cylinder at any given point is the area of the piston times the length of the cylinder. The change in volume is equal to the area of the piston times the distance along which the piston was pushed by the expanding gas. Note that this last line is just the definition of work under constant force in the same direction as the displacement, multiplied by the negative sign to follow the sign convention in chemistry. The experimenter needs to decide the number of levels for each factor in an experiment. For a qualitative (categorical) factor, the number of levels may simply be the number of categories for that factor. However, because of cost constraints, an experimenter may choose to drop a certain category. Based on the experimenter’s prior knowledge or hypothesis, the category with the least potential for showing a cause-and-effect relationship between the factor and the response should be dropped. For a quantitative (numeric) factor, the number of levels should reflect the cause-and-effect relationship between the factor and the response. Again, the experimenter’s prior knowledge or hypothesis is valuable in making this decision. 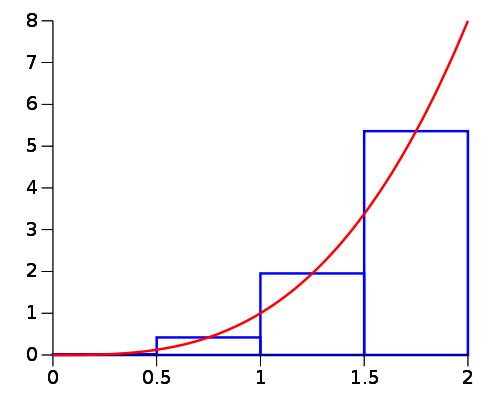 If the relationship in the chosen range of the factor is hypothesized to be roughly linear, then 2 levels (perhaps the minimum and the maximum) should be sufficient. If the relationship in the chosen range of the factor is hypothesized to be roughly quadratic, then 3 levels would be useful. Often, 3 levels are enough. If the relationship in the chosen range of the factor is hypothesized to be more complicated than a quadratic relationship, consider using 4 or more levels.